Making images through sports protocols. This laboratory has been carried out through the use of protocols inspired by sports competitions. The objective was to create a list of body’s rules to play with. 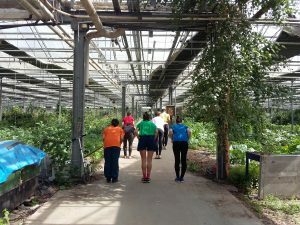 We experimented together how to build up a game of words, movements and colors, using the natural environment as a stage: a wild covered vegetables garden in Mechelen (BE). I brought a book titled ‘ TUTTI GLI SPORT DEL MONDO’ / ALL THE SPORT OF THE WORLD’ as a source of inspiration, some colored T-shirts in order to colored the green environment by flat colors. This workshop has been created for NEWFOUNDLAND that is inspired by the idea of gardening, as the practice of growing and cultivating. The aim is to create a platform and connect people, push for the idea of sharing, support and encourage interdisciplinary research and dialogue, opening a platform for feedback and critical exchange as well as to offer a new experimental zone, where the artists are able to step out of their comfort zone and be part of a new experience.